200% increase in the number of units sold in this 3-building complex. Six units sold this quarter compared with only two units during the first quarter 2014. Total $ volume sold = $5,763,000. All six sales were cash transactions. Highest price paid: Unit 1 Grove Isle 1 #PH10, 3 bedrooms, 2.5 bathrooms sold for $1,600,000. Lowest price paid: 2 Grove Isle #B806, 2 bedrooms, 2 bathrooms sold for $622,500. Click here to read the entire Coconut Grove Journal of Real Estate. Sunday Open House for You! Come and see exactly why this home is considered a hidden paradise. This contemporary splendor boasts 2 full bedrooms and 2 full bathrooms, a beautifully renovated kitchen, and an abundance of natural light, its radiance illuminating the modern white and beige color palette throughout the home. If that wasn’t enough, a private oasis awaits you in the backyard, including a coy pond, Old Man Palm tree, and Eucalyptus tree. Sound too good to be true? See for yourself! This Sunday, September 28th from 3-5PM. After a very quiet first quarter 2014, this “Grand Dame Building” made a huge comeback during the second quarter, with the highest sale of the quarter. Three units sold this quarter compared with only one during the first quarter. Two sales were cash transactions, and one was financed. Total $ volume sold: $8,482,500. Highest price paid: Unit #2101, 4 bedrooms, 6.5 bathrooms sold for $3,362,500. Lowest price paid: Unit #1204, 3 bedrooms, 3.5 bathrooms sold for $2,070,000. Inventory as of mid-July: 11 units. Asking Price Range: $850,000 to $8,900,000. A great quarter for the big players! 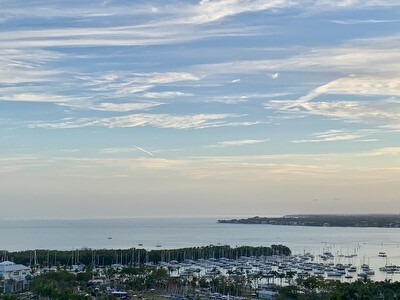 General condo market activity in Coconut Grove is influence by the activity of the big players located along the “Bayshore Drive Corridor.” During the second quarter 2014, the combined sales at the Grovenor, Grove Isle, The Mutiny, Mutiny Park, Ritz Executive, and Ritz Tower accounted for 69% of the total volume in dollars sold during this quarter, with $24,233,505 out of $34,865,394 sold. We are still far from the $7 million and $8 million record sales at the Grovenor House during 2013 and 2012 respectively, but the resale market future looks bright, and higher total sales and higher average prices for the breathtaking views of our gorgeous Biscayne Bay should be expected. Prices of resale condos seem very affordable compared with the asking prices of new Grove projects: Grove at Grand Bay and Park Grove. Our purpose is to introduce Coconut Grove to the world as the ultimate neighborhood for people in search of beauty, tropical elegance, and a high quality of life. The pursuit of our client's happiness and satisfaction is at the heart of our team's culture. Call us to sell or buy a home in Coconut Grove. If you would like to learn more, call Isabelle Andrews 305-546-5421, Alba Biondi 305-323-2595, or send us an email at theteam@groveexperts.com. Second quarter 2014 sales performance of the single-family market is up by 50% in total $ sold compared with the first quarter 2014 ($82,488,855 2nd Q 2014 versus $54,523,940 1st Q 2014). This increase is mostly due to the waterfront market performance. Five waterfront properties sold this quarter for $13,700,000 (only one property sold all last year). North Grove and South Grove have been selling about the same number of properties every quarter since the beginning of 2013. This quarter the median sold price in South Grove jumped 54% compared with the first quarter 2014 ($1,387,500 2nd Q 2014 versus $899,000 1st Q 2014). Nine properties sold in West Grove, with three of them selling for more than $400,000. The number of units sold in the condo market has increased by 43% compared with the first quarter 2014 and 16% compared with the second quarter 2013. As predicted in our first quarter 2014 magazine, amazing sales of pre-construction luxury condos shook the $2 million and above resale market this quarter, with four condos being sold in this price range. Market behavior varies widely for each price segment, each sub-neighborhood, and each building. For our in-depth analysis of your property’s value, please call us. We will share our knowledge with you. Click Here for the Complete Second Quarter Report. We Believe Coconut Grove is Extraordinary. Our purpose is to introduce Coconut Grove to the worl as the ultimae neighborhood for people in search of beauty, tropical elegance, and a high quality of life. The pursuit of our client's happienss and satisfaction is at the heart of our team's culture. Call us to sell or buy a home in Coconut Grove. Are you thinking about buying or selling in Coconut Grove? Call Isabelle Andrews 305-546-5421, Alba Biondi 305-323-2595, or send us an email atTheteam@groveexperts.com for more information. It is rare to find a remodeled home in Coconut Grove for under $1,000,000. 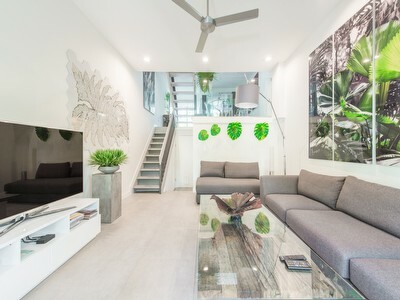 Renovated tastefully, this elegant property offers a contemporary look with a white and beige palette, flooded with natural light and overlooking a beautiful garden with stunning rainbow eucalyptus tree and Old Man Palm tree. The 2 bedroom, 2 bathroom marvel is situated on one of the prettiest and most serene streets in South Grove. Its renovated kitchen, marble floors, and stylish bathroom give it a contemporary feel, while the manicured garden including a relaxing coy pond truly allows you to feel at home.